Teaching is a rewarding profession that creates an atmosphere of development and understanding much like the gardening of flowers. Show your support and appreciation for the fine job your child's teacher has done cultivating and educating with a Personalized Teacher Gift. We have a fine assortment of Teacher Gift Ideas which look perfect in any classroom or home. Great Teachers deserve Great Teacher Gifts and we can help you find the right Teacher Gift. Teacher Appreciation Gift Ideas make the beginning, middle and end of the school year a special time for all. 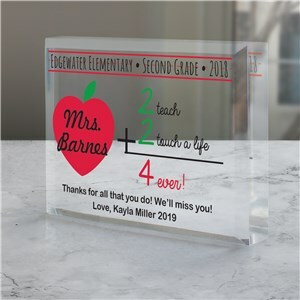 Show your teacher how much you appreciate all their hard work and dedication with our Personalized 2+2 Teacher Keepsake. Personalized Teacher Gifts are created to order for you with any school name, grade, year, choose title,any name and two custom message. Your teacher can display this amazing gift on their desk and cherish for years to come! Say thank you with our Many Thanks Gift Basket Set. 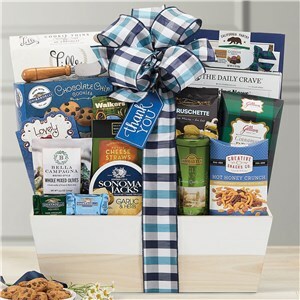 Full of both sweet and savory, this lovely basket features a pretty blue plaid bow color coordinated goodies! With so many delicious treats it is sure to be their favorite! Show your favorite teacher how thankful you are for their hard work and dedication by giving Personalized Teachers Change The World Keepsake gift. Customize these Personalized Teacher Gifts with any name of your choice. Show your favorite teacher how thankful you are for their hard work and dedication by giving Personalized Teacher Gifts. 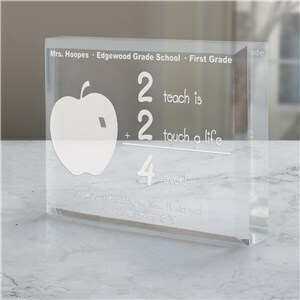 Each Engraved Teacher Keepsake is professionally engraved for optimal presentation. These teacher gifts may be engraved with any teacher's name, school name, grade and any tow line custom message. 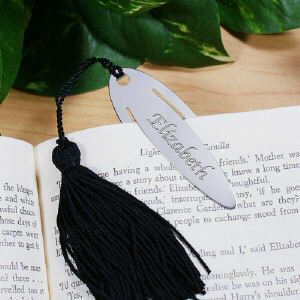 Relaxing and enjoying a great book just got a little easier with your own Engraved Silver Bookmark. A wonderful way to mark your page without damaging the book and looking great when placed on the coffee table or night stand. Give your favorite teacher the perfect gift to show her how much you appreciate her. 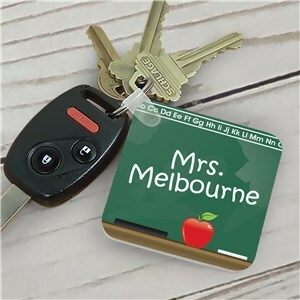 Our Personalized Teacher Chalk Board Keychain is a thoughtful gift to give to any teacher on Teacher Appreciation Day. These wonderful keychains make perfect personalized gifts for teachers. Personalize your Chalkboard Teacher Keychain with any two line message. Buy Personalized Gifts For Teachers Today! Honor your coach for all their hard work and dedication with our Personalized Coach Photo Keepsake. Personalized this keepsake with your choice of photo,design color and any three custom message lines. 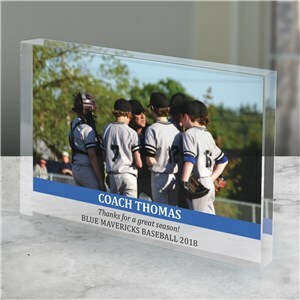 Makes a great thank you gift your coach can display on their desk! Help America Go Green with our Personalized Library Book Bags. Mom, Grandma, Nana & Aunt will all love helping the environment as they carrying around their current selection of library books in this stylish Personalized Library Tote Bag. Use these personalized canvas bags instead of paper or plastic to help the planet. 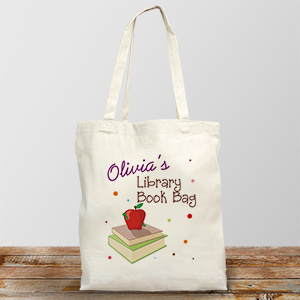 Personalized library bags include FREE personalization! Customize your personalized totes with any name. Do you have the World's Greatest Teacher? Now you can tell your Teacher exactly how you feel on this attractive Personalized Teacher Printed Plaque. Our World's Greatest Teacher personalized teacher gifts are the perfect gifts for a Teacher Appreciation Gift, Christmas and just because! Includes FREE Personalization. Our Personalized Teacher Plaque measures 8"x 10" & has slotted holes for easy mounting. Personalize your Teacher Keepsake Plaque with any teacher's name and any ending 2 line custom message. Please choose she or he. Buy Personalized Gifts For Teacher Today! 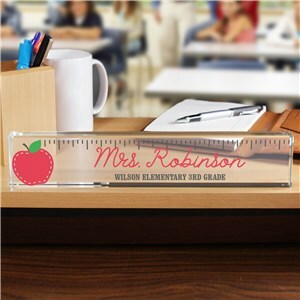 Our Personalized Ruler Teacher Name Plate is a great gift your favorite teacher will cherish for years to come. Personalized Teacher Name Plates are created for you with your choice of any name and custom message. Create that perfect gift that your teacher would love now! 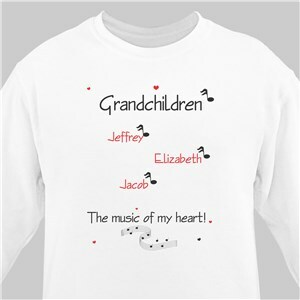 Let the music created by children sing loudly in your heart as your proudly wear these Personalized Grandma Shirts. Our Personalized Grandma Sweatshirt is available on our premium white cotton/poly blend Sweatshirt, machine washable in adult sizes M-4XL. Includes FREE Personalization! Personalize your Grandma Shirt with any title and up to 30 Names. 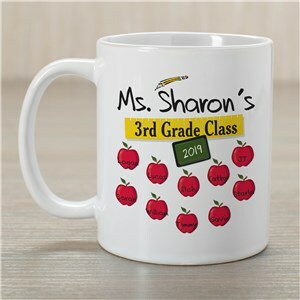 Our Teacher Customizable Coffee Mugs make excellent Teacher Appreciation Gifts for your favorite teacher and classroom aids. What better way to say thanks than with a Personalized Gift for your favorite Teacher. This great school themed mug is sure to look great on any teacher's desk all school year. An affordable teacher gift you will love to give year after year. 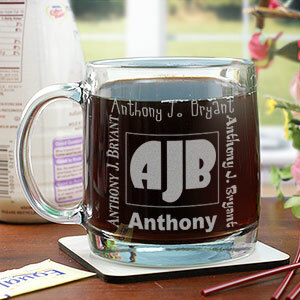 Personalized Mugs are Dishwasher safe & Includes FREE Personalization! 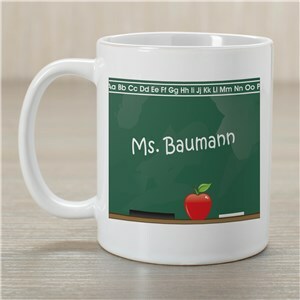 Personalize your Teacher Coffee Mug choice with any name. ( ie. Ms. Baumann ) Mugs are available in different sizes ranging from 11 ounces to 20 ounces. Thank your Coach for all their hard work with our Personalized Thank You Coach Picture Frame. 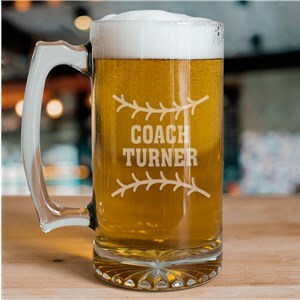 Customize these Personalized Coach Gifts with any sport choice, any 2 digit end and beginning year and 3 custom message lines. Your Coach can proudly display this thoughtful wood frame on their desk! Give your coach a gift he or she can use to relax after a long day of training with our Personalized Coach Glass Mug. Personalized coach gifts like this glass mug can be created for you with any title and any name of your choice. Makes a perfect gift for any coach! 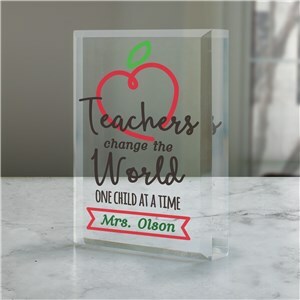 Teacher Gift Ideas from the Leader in Personalized Gifts - GiftsForYouNow.com. All of our Teacher Gifts are more than simply a gift, they are gifts of appreciation and thoughtfulness for a job well done. From Personalized Teacher Keychains, Teacher Frames, & Teacher keepsakes we have all the wonderful Teacher Gift Ideas you will need. 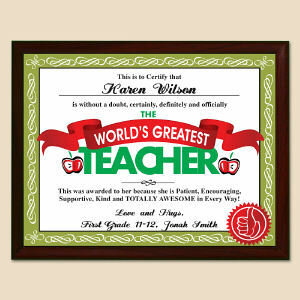 Show your child's teacher just how much you appreciate her with a Personalized Teacher Gift from GiftsForYouNow.com. Your one stop shop for Teacher Gift Ideas.